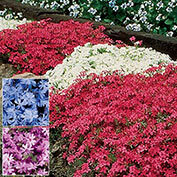 Creeping phlox makes a big impact when it blooms in early to mid spring. Blue Emerald's lavender-blue flowers look impressive when planted en masse or grouped with another color of creeping phlox. 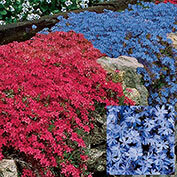 This easy-to-grow ground cover is ideal for planting in rock gardens, along garden edges or draping over garden walls. 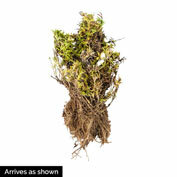 It forms a mat of semi-evergreen foliage that grows 4-6 in. tall. Thrives in poor soils. 2 plants cover 3 sq. ft. Grows best when planted in full sun to partial shade. Zones 4-9. Height: 4 - 6 inches. Spacing: 12 - 18 inches. Spread: 18 - 24 inches. Blooms: Early to mid Spring. 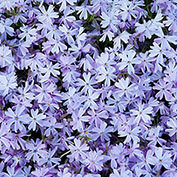 Flower Form: Small starry, five-pointed flowers. 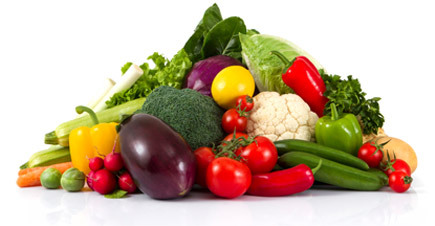 Soil Requirements: Well-drained gritty soil, likes slightly alkaline soil. Growth Rate: Rapid growth rate to 12 inches. Comments: Water weekly first season and during prolonged hot, dry periods in subsequent years. Mix peat moss, compost or well-rotted cattle manure deeply into the soil. Cut back the plant after flowering to encourage dense growth. Good for rock gardens or borders. Excellent Spring color. May experience some browning during winter if in a windy, frosty location. In very cold areas plants may die back.